I Could Be An Olympian! When I was 6 years old, I slipped on the ice while I was walking to the bus stop and knocked out a tooth. I’ve been a nervous wreck about ice ever since. Which may make you wonder why in the world I would try curling. These stones weigh 42-lbs. each, but felt light as air gliding on the ice. My husband was fascinated with curling during the last Olympics. He made a statement (which he no longer recalls) that he thought it would be fun to try. So I looked into it and discovered Cincinnati Curling Club. I signed us up for a Saturday night session with the Social Club and then fretted and worried about how many times I would fall. I am not exaggerating when I say that I will not step outside my front door when there’s ice. Voluntarily going out onto the ice with 42-pound curling stones and brooms seemed like a cruel test of my love for my husband. I did it anyway. And guess what? I had a blast! I was assured that it would be nearly impossible to fall. I did fall, but I was the only one who did in a whole rink full of people, and it only happened when I was running down the ice trying to sweep ahead of the quickly sliding stone. Me. Running on ice! A fall was inevitable. The sport was much more taxing than I would have expected. That may have been due in part to my position as the second thrower. That meant that while my other three teammates threw their two stones per end (the term for each round), I was sweeping. So I was essentially running up and down the rink furiously sweeping the ice for nearly two hours. 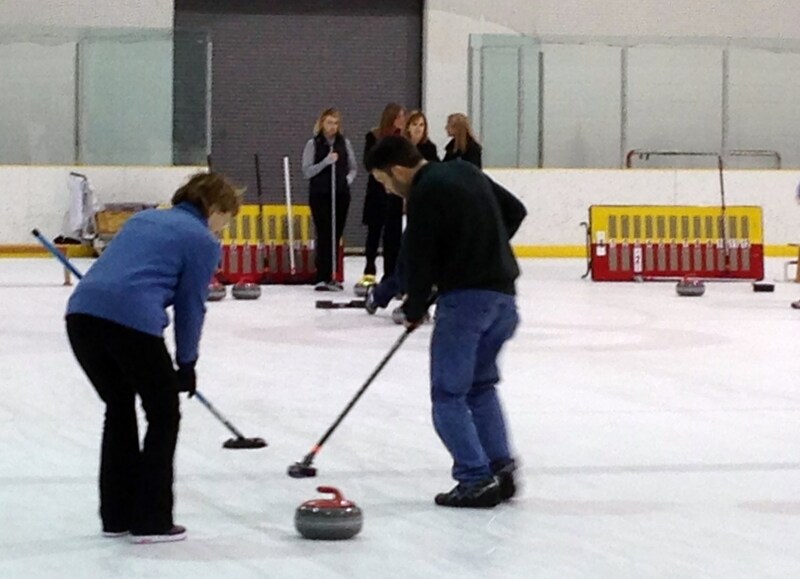 Rumor has it that curling burns between 300-500 calories per hour. I believe it. I was sweating. This guy rarely let his knee drop. You can also see the black ‘gripper” on the sole of his shoe. Our instructor said that I had nice form when I was throwing stones. Maybe at first. It’s not as easy as you’d think. It requires pushing off something like a runner’s mark with one foot on a Teflon-coated slip and the other leg extended behind you in a sort of curtsy while you lightly (haha) glide your stone forward. I started out strong, but soon found myself letting my knee drop to the ice. I learned the hard way — don’t give in to that temptation or your knee will be bruised. What Olympic sport would you compete in? I tried this once too and it is definitely not as easy as it looks on TV. Also, I made the mistake of wearing flat Converse tennis shoes, so my feet were freezing the entire time! That’s funny. Everyone we played with that night was freezing. I was hot and sweating! And usually, I’m the cold one. I can’t even begin to think what Olympic sport I might compete in! But when I was watching the curling on tv, I couldn’t make head or tail of it! It’s a lot like shuffleboard, if you’ve ever played that. It wasn’t too hard to understand; harder to try to get our stones where we wanted them to go. 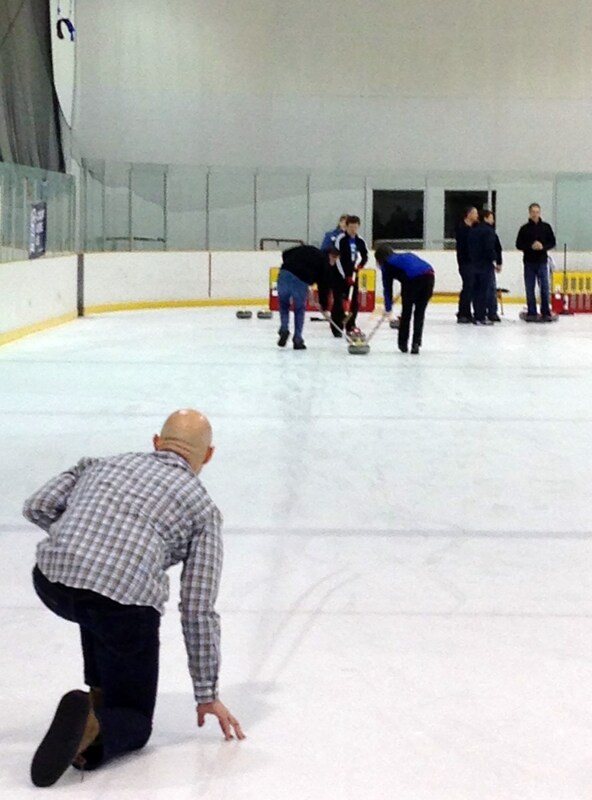 I tried curling in New Zealand…and I thought it was fun too! Not something I’d take up regularly but a bit of a novelty. And yes, harder than it looks! The Social Club invited us back for Spring Leagues, but we didn’t want to commit every weekend to it. I would definitely do it again though. 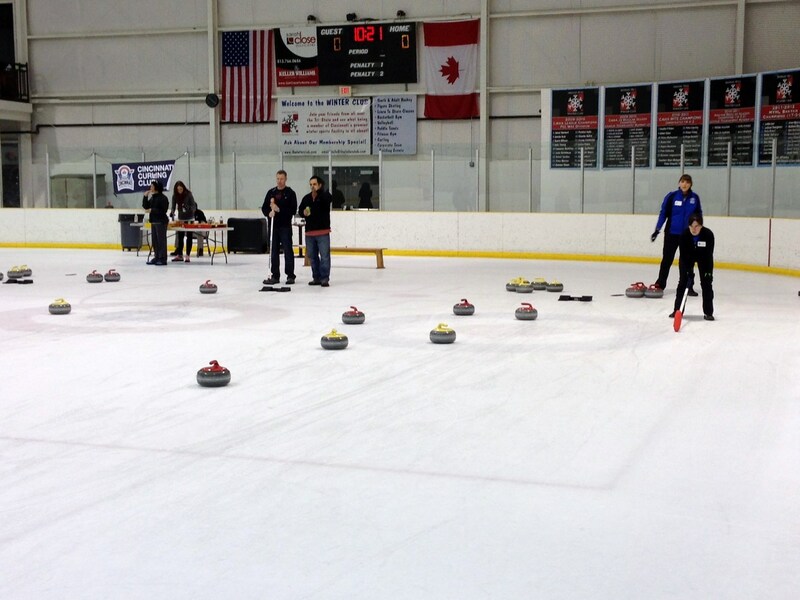 So this is what curling looks like! I’d seen screenshots of it and was utterly confused at how the game was played. It looked like a chaotic, bulky version of hockey to me. If I’d continued my ice skating lessons when I was younger, perhaps I might’ve had a shot at the Ladies Singles. Wow! That would have been something! I can barely stand on skates. There’s absolutely no grace to my movements. 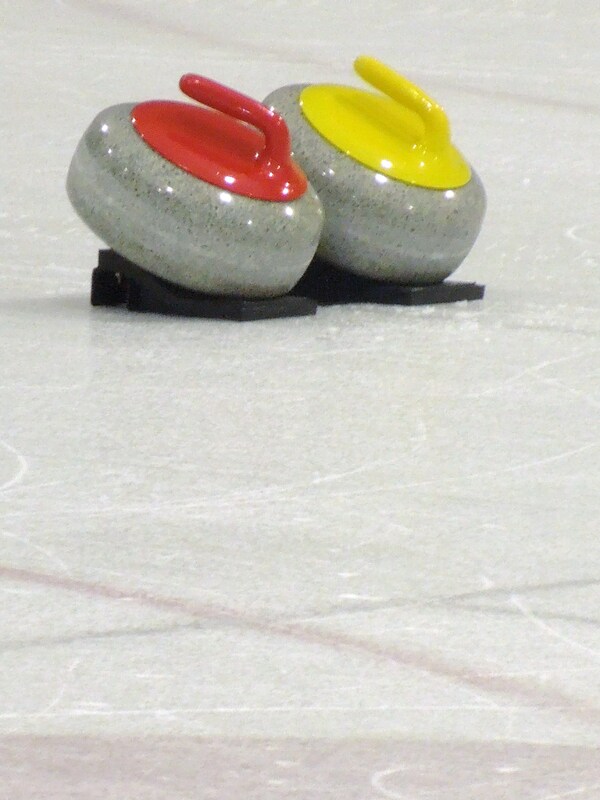 Interesting to read about someone actually ‘doing’ curling. Us Brits became overnight fans and experts in 2002 when our women won gold at Salt Lake City. They play it mainly in Scotland where it’s cold and there’s nothing else to do. I would love to see it played outside on ice by people who know how. Sounds fun. I love watching the sport on TV. Wish I could try it someplace. Definitely fun. And no one seemed to take it seriously, so didn’t care that we were beginners. I remember being introduced to curling in Scotland – I hadn’t really registered it as a sport before. I may have to follow your lead and try it out one day (not sure when that could happen) although I suspect I’d also end up with callouses from broom handling! It definitely gave us new appreciation for the sport and the finesse of aiming stones toward a spot on the ice far away. How fun! I’d never heard of curling as a child. But our pond in Ohio sometimes froze and we played a slippery, dangerous version of ice hockey. Someone always got hurt. I only played once. That was enough for me. Good for you trying your hand (legs and feet) out on curling. My dad curled. I remember his long corn broom. Looked like one of those ones you could ride. haha. I love figure skating! How neat! I was hoping they’d be real brooms, but they were more like squeegees you use to clean car windshields. Progress, I guess. I guess. They do look a little more efficient for sure! Oh my gosh, we are so alike! Your husband mentions something and then you say: “Alright, let’s do it!” Love it.